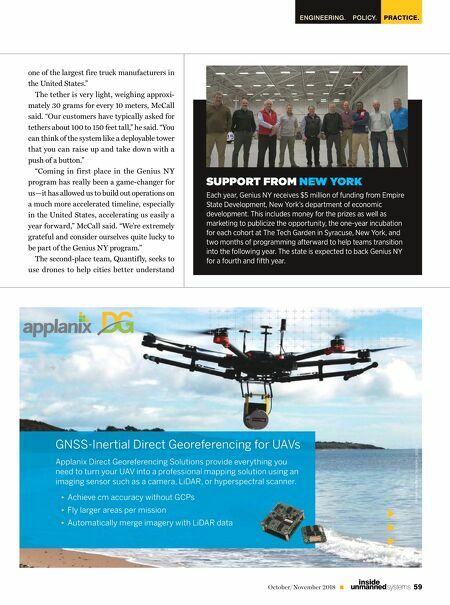 AIR ENTREPRENEURING 58 October/November 2018 unmanned systems inside vesting some $250 million in unmanned sys- tems over the course of five years as part of its Upstate Revitalization Initiative. Central New York already hosts one of seven Federal Aviation Administration-designated unmanned aircraft system (UAS) test sites in the United States at Griffiss International Airport. The state is also home to Fort Drum, one of the largest drone practice areas east of the Rocky Mountains, and the New York Air National Guard 174th Attack Wing, the first Air National Guard Unit to f ly the MQ-9 drone or Predator B. The first round of the Genius N Y com- petition extended from 2016 to 2017. The first-prize winner that year, AutoModality, has successfully launched its "Perceptive Navigation" technology platform, which is de- signed to help drones get as close to a target as a human inspector. This platform underlies AutoModality's Automated Drone Warehouse Inspection Solution, which takes stock of in- ventory 50 percent faster than manual inspec- tion and avoids putting humans in harm's way. Cell tower and vineyard owners are among those interested in the technology platform. THE LATEST WINNERS The six finalists of the current 2017-2018 round of the program were announced in December. The winners of the first-, second- and third- prizes were announced in April. Photos courtesy of Genius NY. 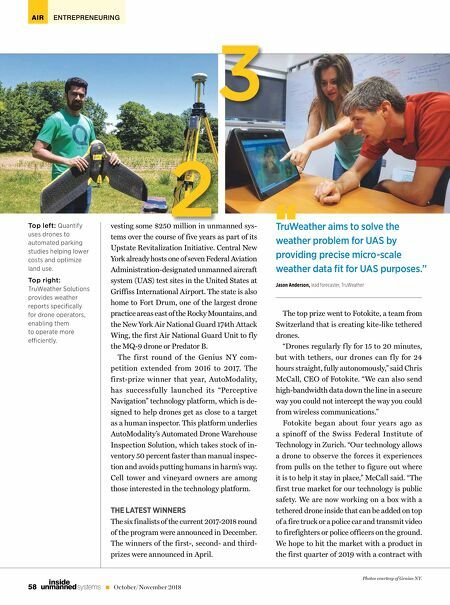 TruWeather aims to solve the weather problem for UAS by providing precise micro-scale weather data fi t for UAS purposes." Jason Anderson, lead forecaster, TruWeather Top left: Quantify uses drones to automated parking studies helping lower costs and optimize land use. Top right: TruWeather Solutions provides weather reports specifi cally for drone operators, enabling them to operate more e• ciently. vesting some $250 million in unmanned sys- 2 The top prize went to Fotokite, a team from Switzerland that is creating kite-like tethered drones. "Drones regularly f ly for 15 to 20 minutes, but with tethers, our drones can f ly for 24 hours straight, fully autonomously," said Chris McCall, CEO of Fotokite. "We can also send high-bandwidth data down the line in a secure way you could not intercept the way you could from wireless communications." Fotokite began about four years ago as a spinoff of the Swiss Federal Institute of Technology in Zurich. "Our technology allows a drone to observe the forces it experiences from pulls on the tether to figure out where it is to help it stay in place," McCall said. "The first true market for our technology is public safety. We are now working on a box with a tethered drone inside that can be added on top of a fire truck or a police car and transmit video to firefighters or police officers on the ground. We hope to hit the market with a product in the first quarter of 2019 with a contract with 3 "